A hearty and resilient plant, lucky bamboo requires little care to maintain its rich green color and lovely visual appeal. Often referred to as the bamboo money tree, you want this feng shui plant to be in top health. Knowing the right lucky bamboo care techniques and rules ensures your plant will be beautiful, strong and healthy. Caring for lucky bamboo isn't difficult. All you need are proper growing conditions. Usually, lucky bamboo is grown in water, but also grows well in soil. When growing a plant in water, place small marbles, pebbles, or stones in the container to give the stalks added stability. Use filtered, bottled, or rainwater for your lucky bamboo plant. This keeps the plant healthiest. Change the water every seven to 10 days to keep your lucky bamboo in top condition. If you keep your bamboo plant in a vase, keep the water levels low. 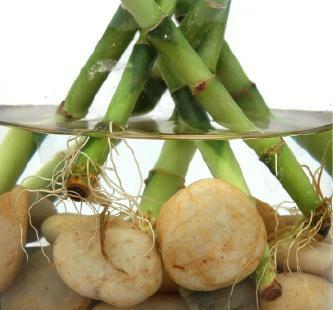 The roots of a lucky bamboo plant grow wherever it contacts water. Never place your plant on a sunny windowsill as the direct sunlight is too strong and the leaves will scorch. Preferring low light, lucky bamboo plants are even happy with artificial light from a lamp. If the bamboo leaves are fading to a light green color, the plant is not getting enough light. Insufficient light also causes slow plant growth. In many cases, the plant will not grow in height or produce any new leaves. To remedy these problems, simply move the plant to a location with more indirect light. The optimum temperature for a bamboo plant is between 65 to 90 degrees Fahrenheit. Lucky bamboo plants may not survive in temperatures below 55 degrees Fahrenheit and should never be placed in front of an air conditioner. Just as direct sunlight should be avoided, extreme heat should also be avoided. Never place your plant near a heat source such as a heating vent or wood stove. Lucky bamboo does not require any regular fertilizer and can survive for years in nothing but clean water. If you do choose to fertilize your plant, use only fertilizers made for lucky bamboo. A plant food called Green Green is popular with many growers of lucky bamboo plants. Lucky bamboo problems occur for a number of reasons; take precautions to prevent and fix any issues that arise while caring for your plant. From algae to the wrong water, learn how to combat the problems which can take hold in your plant through a variety of ways. Since lucky bamboo is generally grown hydroponically at nurseries and green houses, most people keep their bamboo in a vase of water and pebbles when they bring it home. The type of vase your lucky bamboo lives in makes a huge difference as to whether or not it develops an algae problem. Clear vases expose the water in the vase to too much light. The light reacts with the algae spores, causing them to bloom or grow. While too much light can cause algae growth, not enough light can cause your bamboo to fade in color. While you need to keep your bamboo is an opaque vase, you also need to ensure it gets plenty of indirect light, meaning it can be near, but not in, a window. Algae also thrive in nutrient rich water. Phosphates and nitrates are a favorite food source of algae. Many plant foods contain both nitrates and phosphates; overfeeding your lucky bamboo could be the cause of your algae problem, in addition to yellowing of the leaves. If your bamboo is suddenly showing yellowing leaves, this could be caused by using the wrong water. Tap water is full of things like chlorine and fluoride, which can cause your bamboo to begin to yellow or turn brown. Using distilled or filtered water will prevent this yellowing from occurring. If you must use tap water and you know it has high levels of chlorine, keep it in a container on the counter for 24 hours before using it. This allows time for the chlorine in the water to evaporate. If your water is high in fluoride levels do not use it for your plant. Fluoride will cause your lucky bamboo to turn brown and it does not evaporate. Change the vase: If you don't have another vase handy, simply take the bamboo out of its vase, then wash the vase with a warm water and a tiny bit of mild soap. Be sure to rinse thoroughly. Then add the bamboo back to the clean vase. Change the water frequently: Remember to use distilled or filtered water. Move the plant: If the bamboo is in a spot exposed to a lot of direct sunlight, which encourages algae growth, move the plant to an area that receives indirect sunlight. If your plant is not growing well, or has begun to fade in color, move it to another source of indirect light instead. How Long Does Lucky Bamboo Live? If you care for your lucky bamboo plant properly, it can live a very long time. In fact, SF Gate notes it may actually outlive you under proper growing and care conditions. When you take good care of your lucky bamboo plant you are rewarded with a plant that attracts positive energy and adds beauty to your home. Follow these tips and care instructions to ensure you get years of luck in your home.